Introducting the first of the Incognito series shark leaders designed by Catch Sharks. The Sandman™ and Nuetralizer™ are a new Catch Sharks Exclusive aimed to using science and technology to create a stealthy shark leader. The Sandman (Incognito Edition™) Shark Leader is a NEW Catch Sharks Exclusive. 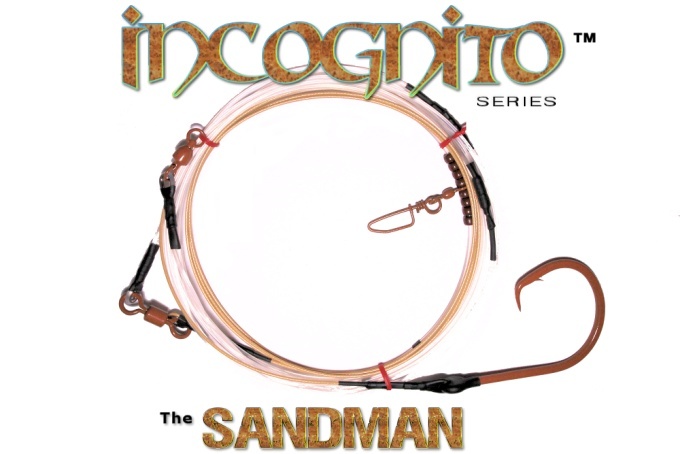 This 30' 'Incognito' leader is made with 700lb Ultra-Clear high quality monofilament and top-grade Sand colored 700lb coated stainless cable. Leading front swivel is a 550lb Hydro-dynamic Ball Bearing swivel. The unique bullet shape provides fluid rotation and decreased water resistance and eliminates line twist. Core link swivel is a heavy duty 12/0 barrel swivel. This leader is a fixed-hook rig. The Hook is a Hi-Carbon Steel 24/0 ED™ (Electroreception Deception) Coated in TS (Tru-Sand™). This Exclusive Catch Sharks Tru-Sand™ coating highly resembles sand with 3d design allowing the hook and other components become virtually camoflauge in the water. Leader is constructed with protective Stainless Steel Thimbles and with compressed plastic covering for protection and elimination of stray line hang-ups. Total length to hook is roughly 30'. This is an ideal, clear water leader for Hammerheads and other large toothies! The Sandman (Incognito Edition™) Shark Leader is ideal for being as stealthy as possible in clear water conditions! The Nuetralizer (Incognito Edition™) Shark Leader is a NEW Catch Sharks Exclusive. 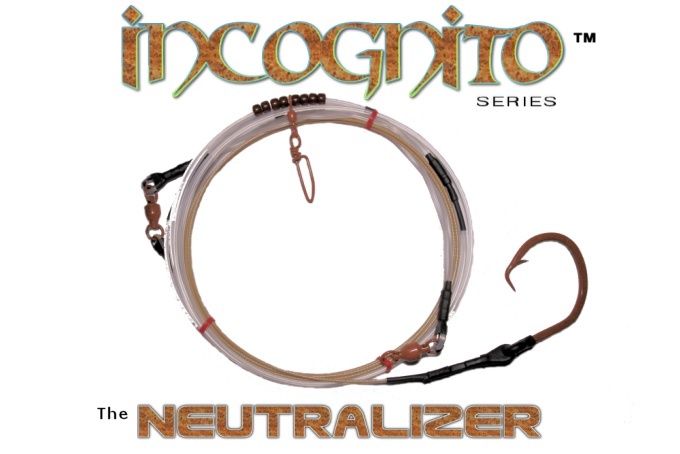 This 20' 'Incognito' leader is made with 700lb Ultra-Clear high quality monofilament and top-grade Sand colored 700lb coated stainless cable. Leading front swivel is a 550lb Hydro-dynamic Ball Bearing swivel. The unique bullet shape provides fluid rotation and decreased water resistance and eliminates line twist. This leader is a fixed-hook rig. The Hook is a Hi-Carbon Steel 20/0 ED™ (Electroreception Deception) Coated in TS (Tru-Sand™). This Exclusive Catch Sharks Tru-Sand™ coating highly resembles sand with 3d design allowing the hook and other components become virtually camoflauge in the water. Leader is constructed with protective Stainless Steel Thimbles and with compressed plastic covering for protection and elimination of stray line hang-ups. Total length to hook is roughly 20'. This is an ideal, all around leader to target anything from Blacktips to Hammerheads! The Nuetralizer (Incognito Edition™) Shark Leader is ideal for being as stealthy as possible in all surf conditions! Introducting the first offshore shark leaders designed by Catch Sharks. 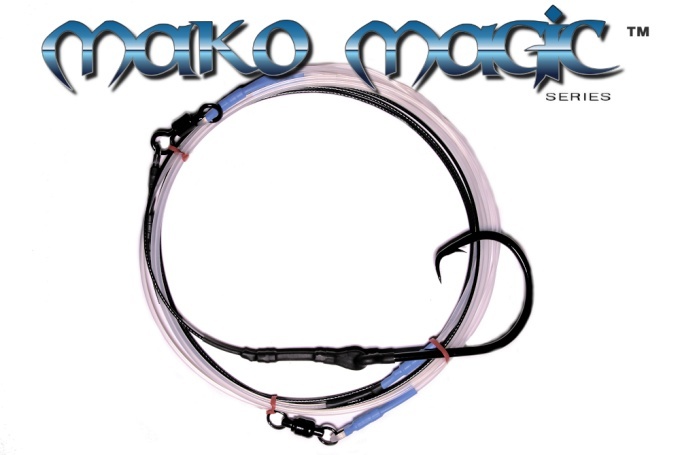 The Mako-Magic™ Series is a new Catch Sharks Exclusive aimed to tackle the oceanes most dominant sport-shark - the mako. This 20' precision offshore leader is made with 600lb ultra-high quality and strength monofilament leader material and top-grade 900lb black vinyl compression-coated 49-strand stainless steel cable. Leading front swivel is 600lb AFW Ball Bearing swivel. 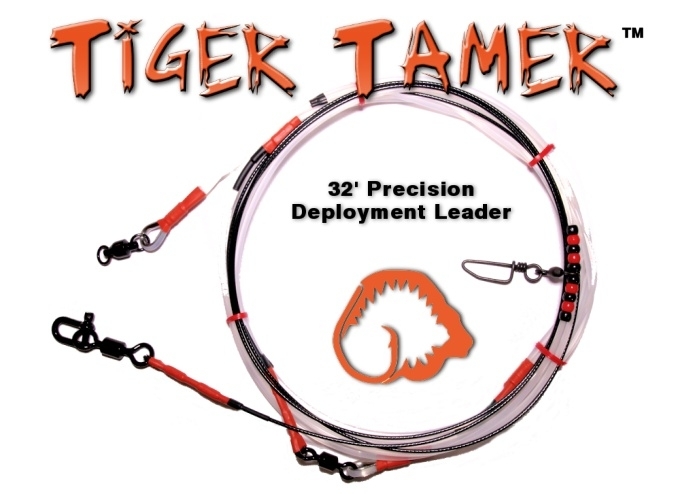 The patented bullet shape provides fluid rotation and decreased water resistance and eliminates line twist. Core link swivel is a high quality 12/0 (1400lb) barrel. The hook is a 24/0 High-Carbon Steel cirlce hook with unique Catch Sharks ED™(Electroreception Deception) Coating available in ME™ Black (Mako-Eye Black) or BBR™ (Baitfish Blood Red). Leader is constructed with stainless steel thimbles for crimped mono protection and double crimped with compressed plastic covering for protection and elimination of stray line hang-ups. Total length of this leader is roughly 20'. Get ready for the Catch Sharks BIG SHARK Contest! We want to see your sharks being caught on Catch Sharks Leaders and Gear! 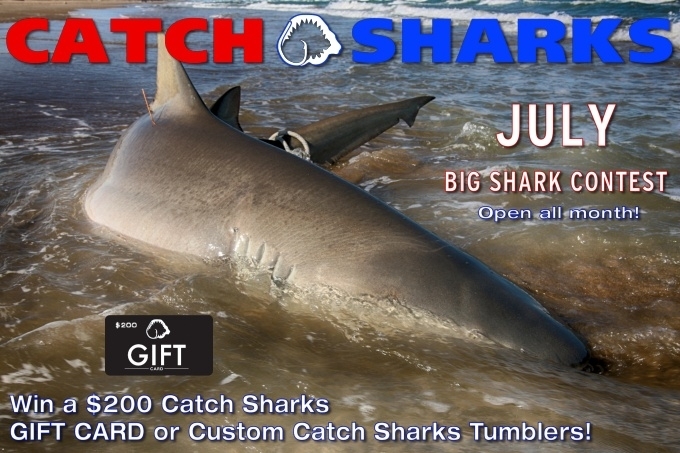 The largest shark (total length) at the end of the contest period (midnight July 31st) will win a $200 Catch Sharks Gift Card available to use at the Catch Sharks online store! 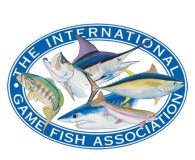 There will also be prizes (Catch Sharks Tumblers) awarded to 2nd and 3rd place, along with largest shark caught on a Catch Shark Drop or an ED Coated Hook. 1. Anyone who catches their shark on Catch Sharks leaders are eligible for the month-long contest. Contest period is July 1st-July 31st. All catches MUST be made during this time period. 2. To Enter, you MUST hashtag your shark on social media - #catchsharkscontest and you MUST post/provide two photos, one with the leader/hook still embedded in the shark (must be able to verify Catch Sharks gear), and another shot with the angler and the shark. You must also state which leader/gear that particular shark was caught on. The entire shark must be visible and in the 2nd photo with the angler. Photos/Posts must be made with post settings 'Public' to be able to see. 3. Length is based on actual measured sharks (total length, head to tail). Being a form of 'honor system', sharks photo'd must clearly appear the length they are being reported. Sharks that do not appear the size reported will be instantly disqualified. We reserve the right to ban or disqualify individuals cheating in this contest. 4. Final decision of the winner(s) will be announced shortly after contest period. All decisions by contest officials are final. One prize, per person, per contest period. Contestants allow Catch Sharks the right to possibly use contest photos for future promotions. 5. Catch Sharks is not liable for damage to individuals, products, or prizes. Please fish responsibly and obey all laws.